Equip: Chance on critical hit to increase your attack power by 1000 for 10 sec. Does this seem like an very high number to anyone 1000 ap? ...Okay. This one had me cream my pants. This... IS so over the top is isn't funny. No other BC trinket grants even HALF of this, not even ones with Use effects. ...And this is just an entry-level trinket ( No "high-end" raids have been cleared yet )... Just imagine Icecrown trinkets! JESUS! Keep in mind that that's a chance on *crit*. Most trinkets at this level have a proc chance of 15%. This effect will have a lower uptime, balancing it out overall. Procs in WoW aren't based on actual chances, because if it were theoretically it could continue to proc forever. The way procs work (on both weapon enchants and chance on hit/cast items) is based on a given value per minute. They must proc that many times per minutes, but WoW breaks it down into a larger timeframe, so you aren't consistently getting the same amount of procs per minute, one minute you could have 1 and the next you could have 4. The WoW engine controls when and how often an effect will occur. 40 Badges from the Vendor. Currently regarded as the best rogue DPS trinket for mut spec, and 2nd for combat. Make that 40 Emblem of Heroism. Has anyone tested if this proccs off seals? There has to be an ICD on this, it's way too powerful to not have one. Most trinkets now have a 10% proc rate and a 45 second internal cd. Either the "on crit" requirement for the proc is a way to nerf the proc rate to balance the awesome proc, or the cooldown is 30 seconds to compensate for it. DST is no where near a 100% proc chance. its a 100% chance to trigger the effect, when the proc condition is met, but the proc condition is itself a chance on hit. as the owner of a DST, it is far from a garunteed once every 30 seconds proc. The internal cooldown is usually 3x proc time, so it's probably 30 seconds. In Flames - The Mirror's Truth. Currently the best-in-game trinket for PVE rogues due to the way poisons now scale with AP & ignore increased boss armor. Internal CD appears to be 45s, with very high proc rate (15-30%.) Basic napkinmath indicates the proc is worth roughly 225-250 static AP, which is rather a rather enormous amount. Combat rogues may be able to get as much as the equivalent to 300 static AP out of it if they finely control their burst damage, timing CDs such as Killing Spree, Adrenaline Rush & Blade Flurry to coincide with the proc. Without taking into account buffs, it's worth at a theoretical maximum 222 passive AP (not "225-250"). It only procs on crits, so it's real value is lower than that. Rawr values it at 166 AP for retribution. For DW classes it's probably somewhere in the middle. In any case, it's probably the best trinket available for most physical dps classes before 25 man content. Doing The Violet Hold heroic it only procced 4 times and I was doing critical hits most of the time doing the entire instance. Actually probably not. It took more than a year before holiday events dropped badge equivilent items. Notice that the holiday drops weren't the most up-to-date island drops, but the old and tired badge drops from Geras. Some people have posted about a lacklustre proc rate on this trinket. Recap informs me after 41 minutes of combat time in a heroic, i gained the Reflection of torment buff (http://www.wowhead.com/?spell=33648) a total of 41 times. This seems to indicate the standard 1 proc-per-minute mechanic. 30 minutes straight on a training dummy revealed the buffed gained 26 times. It's only a pretty small sample, but uptime was 14.79%, shortest time between procs was 50 seconds, average proc-to-proc was 1m9s. The combat log showed it proccing off both white attacks and specials. This is as a combat rogue with a low 20% crit chance on all my attacks. I expect that specs/classes with a greater crit chance would see a slightly higher uptime. Just tested again for 30 minutes with wound poison on my mainhand (it can crit), uptime was still around 14.91%. It's really basic math of course, but, that means the proc is worth ~150 static AP to combat rogues. Anyone know if this works for hunters? Going to assume it does seeing as how it says neither melee or ranged. The wording of it suggests it even procs off spell crits as well. I picked this up on my ret pally. Clearly the more crit you have the better this trinket will be. The reason why this is amazing as a ret pally is due to the fact it procs off any offensive crits we do. That includes crits from judgements,auto attacks, divine storm,as well as any crit damage from a crusader strike. Hands down worth the badges. In addition to the passive AP gain, something to consider that makes this even more powerful. Consider stacking this with other buffs for an incredible burst in DPS. BF / haste pot / AR etc.... You'll find this boosts the value of this trinket greatly. Since the hunter ability volley is often critting like 3+ times pr. second, will it be possible to force out procs using this ability? And do you guys think this trinket will be any good in the arena? This trinket does not currently work for hunters (or all ranged attacks I assume). A friend got his reimbursed by a GM when we noticed it never procced. This isn't true at all, ranged critical hits do trigger the proc. That's odd, since my friends hunter didn't have a single proc a full Naxx 10 run. And why would a GM reimburse him for it if it did in fact work? It's not like people can change their mind and get their Emblems of Heroism back whenever they change their mind. Not true, I was drunk one day and spent arround 140 badges on healing gear instead of buying my feral staff i was saving for....yah....I just told the GM and he/she restored them for me. Just tell them you were drunk prolbem solved he he. You know, he just made 'a funny', I think. Yes they can. But you use up one restoration. And it has to be within a week or a couple of days or so. I'd say October 2009 counts as "In a while". I'd say October 2009 counts as "a while". Did your friend's hunter remember to equip the trinket? Been working perfectly on my hunter for a while now. I can vouch that it does proc on ranged attacks. Absolutely amazing trinket for a hunter of any spec. After TBC came out, there was not many 70 level epic trinkets, and they were not so amazing, Expect after BT/SUNWELL came out. now wtalking about WOTLK trinkets, there are so many, and so many Upgrades from 60 level ones. and this 1k AP is increased by Talents? like Subtely rogue? Mirror of Truth...so you look in the mirror, see the truth and get really angry? Sounds about right. Wondering if this will proc off of Volley crits. I know go for the throat does not, and that should be the same mechanic. For rogues, Fan of Knives' crits will trigger the effect. Will keep you safe from being turned into a purple bunny, keep it close should you wander into the Dark World. Keeps you safe from being turned into a purple bunny, keep it close should you ever wander into the Dark World. The AP gain from this proc is modified by effects like Trueshot Aura. This definitely procs off ranged, yes. For the record. does anyone know if the internal cooldown is shared with the CD of Anvil of Titans? This is a flat upgrade of http://www.wowhead.com/?item=28034. Both have a 10% chance to proc AP on crit and a passive crit boost. Does anyone know if this will proc off of a hunter's pet? By the looks of it, we'll be able to purchase a similar trinket for Wintergrasp Marks of Honor. Mirror, Mirror, who is the prettiest bloode elf around? Anybody knows if that trinket proccs of paladins Judgements ? This trinket is definitely bugged. After first purchasing and equipping it, it never procced once. Someone asked me whether or not it was worth buying, and I decided to start testing, and I couldn't get it to proc no matter what I did. Until, of course, I un-equipped and re-equipped it. So if you're having trouble with it, re-equip it. I believe the buff that is procc'd from this trinket is called Reflection of Torment and it has a lovely, sinister red and blue face icon. And yes, the first day that I had it it didn't seem to procc at all. That or it was procc'ing the wrong buff. Next day I logged on to do some testing of my own and voila, procc'd almost immediately. Every "Chance on hit/crit" items got 45sec hidden cooldown. Well, according to the recent PTR patch notes, hunters are about to weep more with 3.0.8. It's being changed to melee critical strikes only. edit: ah, that change has been shown to be a typo. You would need, on average, 22 swings to connect to cause a proc. Whirlwinds are two chances, your autoattacks are one each and bloodthirst is one. It should take roughly 20 seconds to get 22 attacks to connect. Meaning that the value, for a warrior in mostly 10 and 25 man epics (which would be about the gear level you're looking at to get those stats) would be 10/65*1000 or about 154 AP over time. Obviously the more hit and crit you have, the better it gets. Worth noting that on Loatheb, the value is closer to 190. Also, for faster attacking classes (like enh shaman or rogues) it probably has slightly more value because of the speed at which they can put out attacks. As of Patch 3.0.8 this will only proc from melee critical strikes. The recent change to Mirror of Truth in PTR patch 3.0.8 - Build 9438 is just a typo. Both melee and ranged critical hits will still proc it. I don't know if I just have trash luck or what, but I've dropped over 600 crits and this thing has not proc'd once. As posted elsewhere, simply re-equip this item if it's not working. It'll start working right away. 2) If they can both work can they STACK? As a Death Knight, I have yet to see this proc ever. I've had it for a couple weeks now and nothing. Removing it and equipping doesn't do squat. At least for DK, each spec uses some spell attacks that will never proc this (like Icy Touch, Death Coil, and Howling Blast). I just looked up a WWS from yesterday from two DKs (one Unholy and one Frost) and both had quite a few procs from this trinket. Try the trinket in another slot. On the PTR (build 9464) the on-equip description has been changed to "Chance on melee critical strike to increase your attack power by 1000 for 10 secs." However, it still works for ranged criticals so my guess is that it is simply a typo. 15% up time on fury warriors with titansgrip. Average of 150 ap gain. Has anyone done the math on the comination of this trinket and Death Knight's Anguish ? 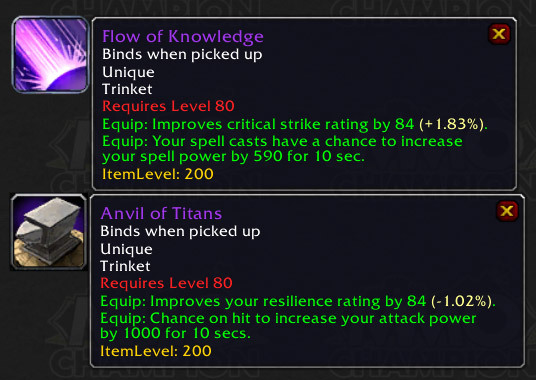 It seems to me that having a trinket that vastly increases your crit rating would get this to proc a lot more often. Has anyone done the math on the combination of this trinket and Death Knight's Anguish It seems to me, at a general look to be a good combo. One largely increases crit rating to proc this tricket more often. New wording says, "Equip: Chance on melee critical strike to increase your attack power by 1000 for 10 seconds." This effectively makes it useless to most hunters. Equip:Chance on melee critical strike to increase your attack power by 1000 for 10 secs. As a hunter who went and spent a whole bunch of emblems on this i was pretty annoyed that it appeard to have been made into a melee only trinket. I contacted a GM and he asured me that it would still proc with ranged. Initial tests seems to show that using both this and Anvil of titans which has an identical proc effect does in fact double the times it procs, though it does not stack. Running 4 five minute tests showed that when using one of them I got an average proc rate of once per minute, while using both procced around twice a minute if not slightly more than that. In that case, your DK fails sd78. As of 3.0.8 the text no longer says on Ranged critical, but it still does procc on ranged critical hits. Here's a link to the blue post by Ghostcrawler confirming that the tooltip is a typo. Always good to see it from an official source. Is this changed in patch? The Edit portion is correct, just like the supposedly instant-cast scare beast that was supposed to be implemented in one of the earlier patches, the mechanical change was recalled abruptly before the patch because Blizzard's armory statistics noted that a substantial number of hunters had already purchased it. After a test of 100 Auto Shot crits on a dummy (using Recount and another addon to note crits and procs), 11 of those 100 triggered the effect. The tooltip is a misprint, don't start submitting your tickets yet, it still works for ranged attacks. Blizzard intends to correct the tooltip in the next patch. There are two main issues I see a lot of people posting about with regards to this trinket and others like it. A lot of this information is on different pages or not easy to find, so I thought it'd be a good idea to post this in plain view. Most trinkets with proc effects do stack with on-use trinkets and effects . Also, there are only a few cases where a proc from one trinket will not stack with a proc from another trinket. Two trinkets with on-use effects will not stack, and the second trinket will only be applicable after the first trinket's effect has faded (with only a handful of exceptions). Please note that there are exceptions to each of these rules, although they are rare. The Mirror of Truth has NOT changed. We tried to clean up the tooltip to make it clear that it wasn't spells that proc the item. Both melee and ranged attacks will proc it. Sorry for the confusion. After a test of 10,000 Auto Shots on a dummy, it is confirmed that the proc is still triggered on ranged criticals, the rate is still 10%, and every proc is followed by a 30-second internal cooldown. The behavior of the trinket is the same as in 3.0.3. On a personal note, I hope Blizzard intends to correct the tooltip in the next patch to reflect that it's restricted to all physical critical strikes. the thing i don't think people consider with chance on proc trinks is the unpredictability of when it procs. what if i get my proc at the end of a fight? what if it procs at a point when i need to move away from the target to avoid some particular damage? 10 seconds isn't a lot. the proc is going to be wasted a good amount of the time. it's worse when it's a low proc rate / high +dmg like this trinket. for example, compare this to sphere of the red dragon's blood, a drop from h-nexus. it has passive +55 hit which is better than the +crit on mirror of truth in most cases. it has +670AP on use for 20s, meaning, use it when you know you'll be on the boss for 20s. it's duration is 2x as long as mirror of truth so per proc / use it's better (670 over 20s vs 1000 over 10s). the only question is the proc rate. a rogue above quoted it at around every 70s for mirror of truth. if so, that'd made mirror of truth about 1.5x as powerful a red dragon's blood w/ regard to AP. having used mirror of truth on a DK with about 30% crit, i didn't see anything close to that proc rate on mirror of truth. i purchased mirror of truth pre-3.0.8 when the text read that it procs on any crit, where it actually only procs on melee / ranged crit (the text was corrected). as an unholy DK, a good portion of damage is coming from AOE spells, dots, and spell attacks. that might explain the low proc rate for me. if it did proc on any crit, it would be amazing. because the text didn't match the actual behavior i was able to get a GM to let me "return" the trinket and get my badges back. As a prot paladin, I can confirm that it procs from judgement, shield of the righteous, hammer of rigtheousness, and strangely enough, avenger's shield. Hunters take a deep breath, this item DOES work with ranged attacks. Seen it proc several times since patch. Right now the trinket specifies "melee critical strike", but I was skilling up crossbow on critters and it proc'd Mirror of Truth. So right now, it may say Melee Critical Strike, but seems to work for range as well. As you all can see the tooltip of Mirror of Truth says: "Equip: Chance on melee critical strike to increase your attack power by 1000 for 10 secs." I've tested with my hunter, and i can assure you it proc at ranged critical strikes aswell. It gives crit rating. And procs off crits. OK for the record THE TWENTH ONE also .. this DOES proc of range, if you'd actually read the comments before posting one you'll see at least 5 different posts about how IT DOES PROC WITH RANGE a few people even provided a link for the OFFICAL post from Ghostcrawler that states it also, but just in case you missed it the first 5 times here it is again. now before bothering to write a comment about does it proc or blah blah READ the previous comments, especially since there not even two full pages of comments yet. I look forward to seeing the Mirror of 77% Probability, the Mirror of Maybe, Maybe Not, the Mirror of Mostly Falsehood and the Glass of Lies. For those who don't get the reference. I find it funny to see the tooltip of this trinket. It's like Blizzard wants to say that we are all tormented or something. So the reflection you see from looking in to the mirror, is a tormented one? Is there an Internal cooldown? Might be a reference to the band In flames song "The Mirror's Truth"
Through my calculations, for an SV Hunter, this is the second-best trinket in the game. And by passive AP, I mean constant-generalized Attack Power. Ralkos, the post you are refering to doesnt exist :P.. So it only gives about 70 static Ap. DMC:G - Uptime = 15 seconds out of 51 seconds (average) = 29.4% up-time. 300 AGI proc yields 390 AGI for SV Hunters. 390 AGI proc * .294 uptime = averaged 114.6 AGI = (to compare to FotFF and MoT) 229 AP. Passive 90 AGI yields 117 AGI for SV Hunters, which equates to 234 AP. Adding the Proc to the Passive benefit, we get 229 + 234 = 463 AP value. proc of 1000 * .196 = averaged 196 AP. 84 passive crit = about 168 AP. 168 AP + 196 AP = 364 AP. FotFF = 320 passive AP. regardless of the dummy tests i can say after 3 heroics i seen an increase of about 10-20 dps.....i bought this to take place of a green (Chuchu's Tiny Box of Horrors) so to be honest im more than a bit diappointed with the proc rate.. Anyone have some info on how this stacks up to Meteorite Whetstone(My current second trinket) and Fury of the Five Flights? Yes, I know Fury is better, but Im looking more for info on just HOW much better(Or worse) this thing is compared to those two. This is from the perspective of a survival hunter, btw, though I'll probably be swapping back and forth from it to BM come Dual. SV's Hunter's Explosive Shot has a chance to proc his trinket 3 times for one ability. In addition to that, in raids, our crit chance is somewhere around 60% - making what you've said, inaccurate. You were speculating, while I actually tested. Big difference. Conclusive answer? Yes, this procs once every 51 seconds in a raid, on average. While you should indeed keep this with you while traversing the Dark World, I believe you may be thinking of another item. can this and anvil of titans stack?or not? As they give the same buff, they refresh eachother rather than stacking. A good point, and worth making. It's important for Paladins to remember that a lot of their techniques are physical abilities that reflect their martial training, not spells. The most obvious example is Crusader Strike but even some moves that appear to be magical abilites such as Divine Storm actually count as physical skills and can therefore be used while silenced and proc equip abilities such as the one on the Mirror/Anvil etc. I haven't done any measuring, but equipping this trinket for a couple of months now, I think I've seen it proc maybe five times. That's 10 of thousands of melee hits, and a whole lot of crits (a feral druid with almost 40% crit chance). Each time I was like "what was THAT?" oh, MoT. DPS testing bears this out too, my dps overall is better with the Crusaders Locket even. The Mirror of Truth is horrible, and I see I'm not the only suspicious that it's bugged. According to wowgala.com, this is the most popular item amongst the top500 pve-guilds worldwide. I would like your advice on which trinket to use when 3.1 will be out : should it be the Mirror or the buffed Darkmoon card : Death for a ret paladin. To get the most out of the trinket, I suggest making a trigger for the proc in your combat text addon of choice to clearly see the proc and use CD abilities during that time. For example Rapid shot for hunter, Avenging Wrath for ret pally, your other use:trinket, etc. The aura that gets applied to you is called Reflection of Torment. Do anvil of titans and mirror of truth stack? As a fury warrior i've had an issue with this trinket (correct me if i'm wrong). It seems that when it procs it overwrites my battle shout buff, so that when the proc wears off i'm left having to rebuff battle shout. I know that a pala's blessing of might will overwrite it but i was grouped not with a pala yesterday and my 5 minute battle shout would be gone during the first pull. Can anyone provide insight as to whether or not physical dot crits can apply this effect? Something like a Rip or Lacerate crit on a druid or for those with 4pc T8 rogue. Ok i have about 30% crit chance without this trinket...but i do have Darkemoon Faire card: Undeath...I can lose one of the trinkets but i want fury of the flights so i have more attack power...what do you think is better this or http://www.wowhead.com/?item=42990. Equip: Improves your armor penetration rating by 84. Equip: Each time you land a physical attack you have a chance to gain 1008 attack power for 10 sec. Edit: Sorry, Trial Of The Champion, not Crusader. Following Ulduar 10 and 25 Man runs. WWS reported a 15%-18% uptime. So Mirror of Truth and Banner of Victory will never proc together? This trinket will NOT work together with (from the Brewfest Boss). They both use the exact same buff, so they will NOT refresh each other and not increase the uptime of the buff, since they share the same internal Cooldown. Do not use both at the same time. Yes they can proc at the same time. They do not share a cd. Do it stack with Banner of Victory? would be nice then for me as DK! That tooltip is liable to break up a marraige if they don't fix it soon. Will this proc along with Banner of Victory ? or at least will they alternate procing, one time Mirror of Truth and then while its on CD Banner of Victory may proc?. How affected are these two trinkets by enchants such as Mongoose ? Im asking because atm I have both Mirror of Truth and Banner of Victory on my Fury warrior and I was pondering if adding Mongoose to my two, 2H weapons would be an optimal DPS boosting setup. Allways something procing between enchant and trinkets to boost AP even further. Thank you for all your help, and hope this is not a redundant question, but the few references I found didnt answer my question in whole, only somewhat partially. Look above - they merely refresh one another instead of stacking. This trinket's effect stacks with needle encrusted scorpion and lets me hit people for 12k+ :) As a Fury warrior, I need all the help I can get, until I get the gear. ;) I have a hell of a time deciding between this and Mark of Supramacy, and its vanity mostly...my gearscore goes way up...its annoying to see how many people appear to equip inferior items just for their gearscore, I annoy myself! Is it just me or is this still one of the best trinkets in game? I'm a warrior in 245/251 gear and i still use this as one of my trinkets. I'm sure there are better ones out there, but if you don't feel like farming for them, just pick this one up. The new LFD system made badges easy to get, and I really feel like this is worth the 40. In no particular order. Not every one listed is an upgrade. While most are, a couple are downgrades and a few are side grades depending on your gear. Note that as stated earlier, Coren's Chromium Coaster, which drops from Coren Direbrew during the Brewfest event, has the same stats as this trinket. Since you can pretty much chain-run Coren (his body drops trinkets with every kill) all day if you want, anyone looking for Mirror of Truth should be able to get the Coaster (during the event of course) without having to give up 40 emblems. And since Coren goes down in no more than 30-40 seconds with most groups, farming this shouldn't take more than 10-15 minutes at the most. Unless like most of us you have horrible luck with the RNG. Do anyone know if this "Chance on CRIT" (as mentioned in an other comment), stacks with the proc from Banner of Victory? Equip: Chance on melee and ranged critical strike to increase your attack power by 149 for 10 sec.